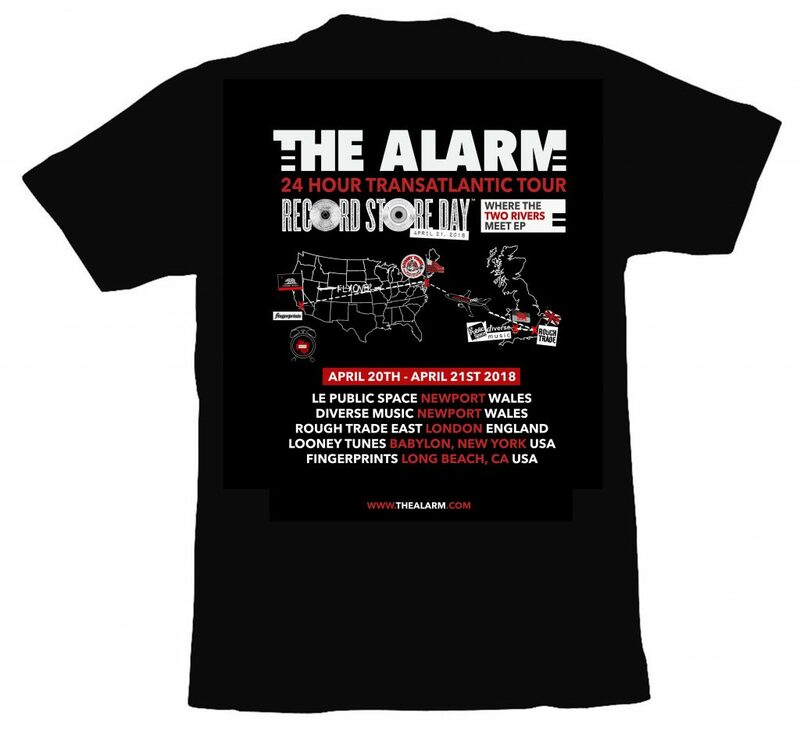 Today, the alarm.com is launching an official limited edition The Alarm = 24 Hour Transatlantic Tour T-Shirt, dedicated to the historic event that Mike Peters is undertaking on World Record Store Day, and calling on all Alarm fans to show their colours this April 21st 2018 to celebrate the release of the brand new Where The Two Rivers Meet Extended Play 8-Track Mini Album. By sharing your photo online (and using the appropriate hashtags which will allow us to see it), you will automatically be entered into an online Alarm lottery that will entitle the winner to a unique and special prize (that will be revealed in the coming days). The winning entry will be announced by Mike Peters, following his final appearance of the day, at Fingerprints Records in Long Beach, California. So post your picture on on April 21st, and let’s celebrate and create an amazing photo journal of fans in their Alarm t-shirts. We are always intrigued by the historic showing of shirts that people wear to Alarm gigs and still see shirts from the very earliest prints of The Stand EP cover, to rare Poppy / White Cross prints, right through to modern classics like the Loud Hailer Under Attack Tour T’s. We want to see you in your very best and most favourite shirt, be it vintage or modern. On the day itself, the alarm.com will re-tweet and repost all the very best and most adventurous photos across our social media platforms, especially those of you who get down to a record store and are photographed with the new release Where The Two Rivers Meet. Show your colours on World Record Store Day. Make sure you get to a record store and be a part of this brand new chapter in the ongoing history of The Alarm = Where The Two Rivers Meet. Order the 24 Hour Transatlantic Tour T-Shirt Now. The exclusive new T-shirt (which features a new album / 2018 tour design by Daniel Shearn with Tour Map depiction and event dates on the reverse), is on sale now. NB: The 24 hour Tour T-Shirt will only be available to order for a limited period until midnight on April 21st. The shirt will also be on sale at the Sold Out Listening Party on April 20th.